Ectatic corneal disease (ECD) or corneal ectasia is a group of progressive eye disorders characterised by thinning and bulging of the cornea, and can result in moderate to severe impairment of vision. Recent advances in corneal imaging systems allow for the detection of mild or subclinical stages of the disease, which is fundamental in face of the novel strategies for minimising progressive ectasia after laser vision correction procedures, such as LASIK and SmILE. At the European Society of Cataract and Refractive Surgeons (ESCRS) Annual Meeting, in Lisbon, in October 2017, Renato Ambrósio, Medical Director of the Instituto de Otho and Refracta-RIO, Rio de Janeiro, Brazil, discussed the importance of diagnosing ECD and how advances in corneal imaging technologies can enhance diagnosis. Renato Ambrósio Jr. is a consultant for Oculus, Alcon, Zeiss, Allergan and Mediphacos. This is an expert interview and as such has not undergone the journal’s standard peer review process. No external funding was received in the development and publication of this article. Ectatic corneal disease (ECD) or corneal ectasia is a group of progressive eye disorders characterised by thinning and bulging of the cornea, and can result in moderate to severe impairment of vision. Recent advances in corneal imaging systems allow for the detection of mild or subclinical stages of the disease, which is fundamental in the face of novel strategies for minimising progressive ectasia after laser vision correction procedures, such as LASIK and SMILE.1,2 At the European Society of Cataract and Refractive Surgeons (ESCRS) Annual Meeting, in Lisbon, in October 2017, Renato Ambrósio Jr, Medical Director of the Instituto de Otho and Refracta-RIO, Rio de Janeiro, Brazil, discussed the importance of diagnosing ECD and how advances in corneal imaging technologies can enhance diagnosis. Q: Why is ectasia so important? There has been a great growth in interest in keratoconus and ECD. I consider ectasia to be not only a disease, but a true novel specialty in ophthalmology. We have a lot of patients and tremendous progression in technology to improve diagnosis, prognosis and treatment. Q: What are the major challenges of diagnosing ECD, and how have advances in corneal imaging technologies enhanced the diagnosis of ECD? Our challenge has evolved from the detection of very mild cases of the disease towards the characterisation of the inherent susceptibility for ectasia progression. We have the technology to characterise the front surface of the eye or topography. We also have tomography that provides 3D reconstruction, segmented tomography that provides epithelial mapping, and corneal biomechanics. Other important information is the optical properties or the wavefront of the eye. I am sure that in the future we will have more molecular biology tests. It is important that we are conscious that these technologies generate a tremendous amount of information and we should learn how to use these data to make good clinical decisions to better help our patients. 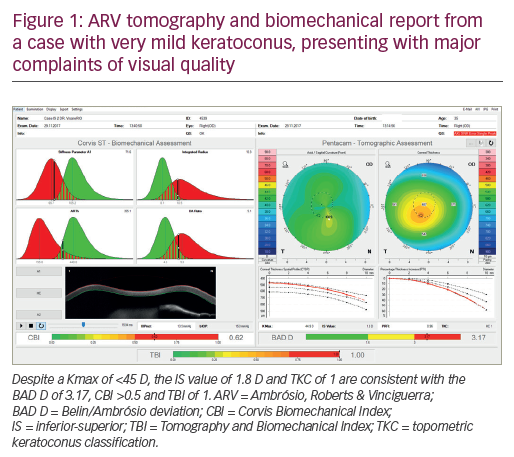 The integration of data with artificial intelligence has gained momentum, such as technology that was developed with Scheimpflug tomography, and biomechanical data from Pentacam® (Oculus, and Corvis® (Oculus, Wetzlar, Germany).3 Note the examples of Figures 1 and 2, of a case with very mild keratoconus that presented with a relatively low Kmax of 44.9 D in the right eye, and even milder or fruste disease in the left eye. This patient had no history of contact lens use, had distance corrected visual acuity of 20/20 but complained about the quality of vision. In fact, he presented as a refractive candidate and such diagnositic sensitivity is fundamental to screen such cases with higher risk for ectasia progression. Also, screening for ectasia risk prior to refractive surgery is different from diagnosing ectasia,4 and is also different from classifying and staging the disease and from giving prognostic information. Q: What have been the most important recent developments in the treatment of ECD? Keratoconus is a new subspecialty, and it is important to remember that many technologies have become available. Twenty years ago, penetrating keratoplasty was the only surgical procedure. Now we have cross-linking, intracorneal rings for keratoconus, phakic intraocular lenses and custom ablations with algorithms for normalisation of the cornea. However, we should understand the differences from therapeutic surgery, aiming to restore vision, from refractive surgery. This becomes a problem; as refractive surgeons, we aim to improve the patient’s uncorrected vision by reducing or eliminating the need from glasses and contact lenses. It is important, however, not to harm the patient with a refractive procedure that is not needed. This is the paradox and paradigm of ectasia. We have changed the paradigm in that we originally only had keratoplasty and now we have many procedures available. Conversely, the paradox is that when you don’t need surgery, you should not do it, or at least be very careful. However, when it is needed, it should be done as soon as possible because if the patient is progressing, the prognosis is getting progressively worse. We know that when a patient presents with an advanced case of keratoconus, the likelihood that the patient will need a corneal transplant is much higher. The transplant procedure has also improved greatly because of all the benefits of deep lamellar keratoplasty which leaves the endothelium in place so the risk of a rejection is substantially minimised. However, this is still a transplant and has all the issues of a transplant. In fact, there is a thin line between performing the procedure too soon or too late, and we need to base the decision on objective parameters. This is difficult to standardise because different surgeons think differently. We also need to understand how to properly use diagnostic data for making conscious decisions. We have to be careful to educate our patients and their carers, because most of them will have just passed the paediatric age. We have to explain when and why the procedure is needed. There are basically two reasons: first, if their vision is not good despite glasses and contact lenses, and second, if there is disease progression. This is where we have to use objective methods to see progression in a very sensitive and specific way. Another important factor is to educate patients of the dangers of eye rubbing, which is bad for eye health and can cause kerotoconus and can aggravate keratoconus or cause ectasia in any eye considering the innate biomechanical resistance and severity of the trauma. There should be a campaign to inform the public of this risk. It is also important to treat any allergy at the ocular surface to minimise the problem, but the message that eye rubbing is bad for ocular health, should be emphasised. Ambrósio R Jr., Klyce SD, Wilson SE, Corneal topographic and pachymetric screening of keratorefractive patients, J Refract Surg, 2003;19:24–9. Ambrósio R Jr., Randleman JB, Screening for ectasia risk: what are we screening for and how should we screen for it?, J Refract Surg, 2013;29:230–2. Ambrósio R Jr, Lopes BT, Faria-Correia F, et al., Integration of Scheimpflug-based corneal tomography and biomechanical assessments for enhancing ectasia detection, J Refract Surg, 2017;33:434–443. 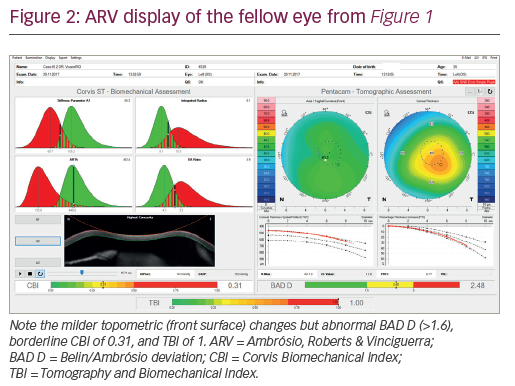 Ambrósio R Jr, Belin MW, Enhanced screening for ectasia risk prior to laser vision correction, Int J KECD, 2017;6:23–33.